Saturday was our first true “free” day on this mission. Beautiful and sunny skies, a relatively smog free atmosphere and warm temps made for a perfect time to get outside and explore. Of course, shopping came first. I hate shopping, but not here. Gotta live the dickering, man. It’s in the blood somewhere. 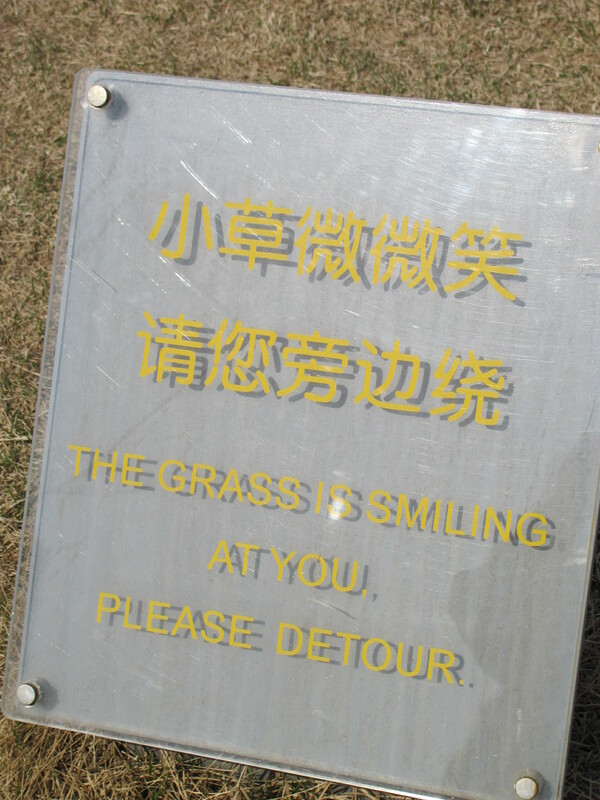 But it is sure not for everyone. 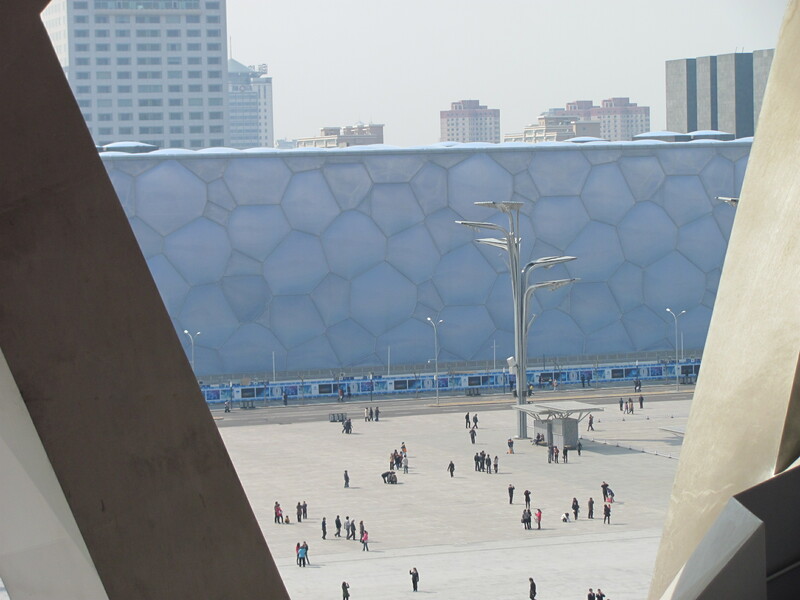 After pulling ourselves away from the Silk Market, we grabbed a cab (woulda taken the subway, but cab fares are obnoxiously cheap here – 40 Yuan (about $6) for a half hour trip… ) and headed for the main Olympic venues, including the Beijing National Stadium. 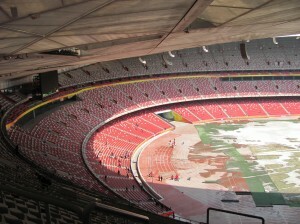 The 90 some-odd thousand seat stadium is an impressive architectural feat. I was awestruck when thinking about the number of welded connections that would have been necessary to erect this thing. 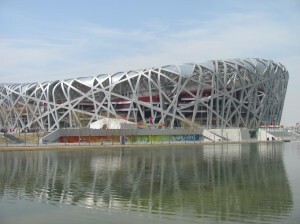 “The Bird’s Nest” contains 36 km of steel sheeting! 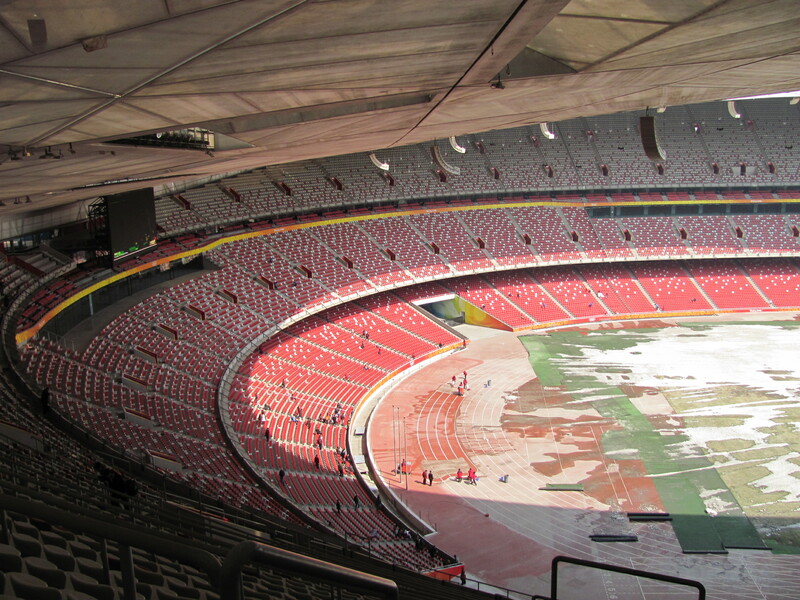 We just missed by a few weeks seeing the largest ski hill in Beijing… inside the freakin’ stadium! When you look at the pics below, that is what the snow on the floor of the facility is all about. 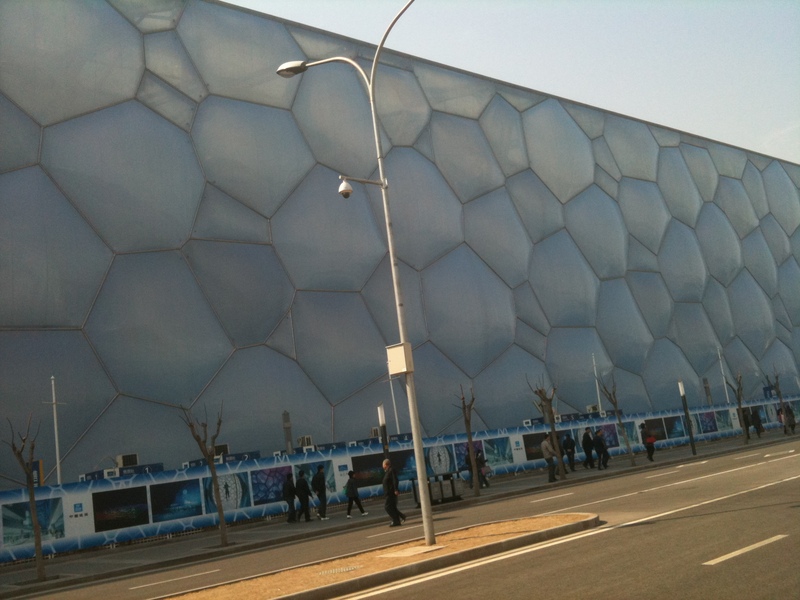 As well, we saw the water cube – the place where all of the aquatic events were held. Pretty cool, but it was closed due to renos so we couldn’t explore inside. Along this line, one of my colleagues noted something, and I agreed, and that is it is to wonder what these stadiums will look like some 10 years down the road. Even after only a year and a half, there are signs of disrepair. Peeling paint, missing bricks, broken pavers are commonly seen. I guess the government’s priorities are elsewhere now. I’m glad I had the chance to see it before it deteriorates too much. Had some awesome Thai food last night in a part of town close to the Canadian embassy. Nice to have a change of pace. Off to the Pearl Market today to get the obligatory – you guessed it – pearl-related gifts. 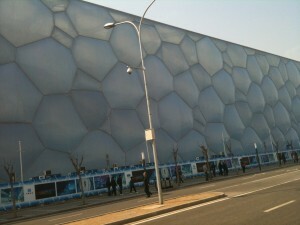 Then we are visiting the Temple of Heaven, which is conveniently located right across the street from the Pearl Market. 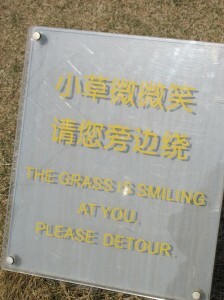 The Chinese think of everything!